An acoustic attenuation solution provided by Sto has helped create a new acoustic environment at a leading London restaurant. The StoSilent Distance system has been installed at Lyle’s – a restaurant that is quickly becoming recognized as one of most prestigious establishments of its kind in the capital. 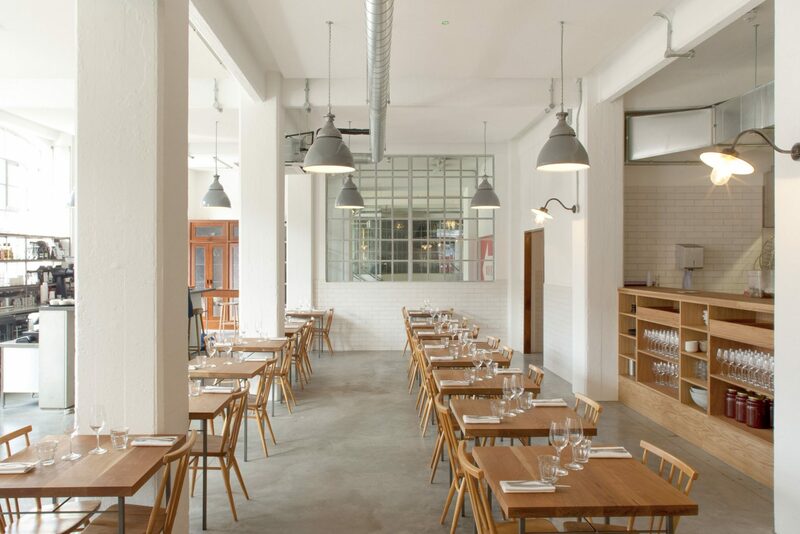 Located in the historic refurbished Tea Building in Shoreditch, Lyle’s frontage consists of original individual glazed windows, which lead into a clean modern, large open plan area. Within this area there are exposed HVAC services below the soffit, a bar space and an open kitchen experience. “Although the interior is clean, light and modern and gives a feeling of space, unfortunately all the original features of the building, i.e. glazed tiles to the walls, original concrete columns and polished concrete floors are hard and reflective and only add to the acoustic conundrum with attenuation, reverberation and speech clarity,” explains Sto’s Technical Consultant for Acoustics, Mike Wallace. “Add to the mix the open kitchen and bar, mood music and hard wooden tables and chairs, and it was vital that the correct acoustic balance was achieved. The Sto Silent Distance 115 system was chosen to achieve this balance and Sto worked closely with Billy Hookway of Trishna Group to provide the optimum design. The Sto Silent Distance 115 system allows the creation of seamless, sound-absorbent walls and ceilings up to 200 m², allowing inclined planes, sharp and consistent joints, bulkheads and floating return bulkheads. In line with the aspiration of the client wishing to have a modern, clean, uncluttered aesthetic, it was natural for Lyles to choose the Sto Silent Distance system. The interior soffit consisted of existing pre-constructed square concrete coffers, and the client wished to retain these, so Sto designed the individual canopies to be tight to the soffit and give the impression of height and depth, and to accentuate and express the natural concrete coffers. The use of the Sto SW150 minimal void solution, in conjunction with the 25mm 115 board, provided the perfect balance in achieving the all-important acoustic design and the aesthetic requirements. Installation of the system was managed by Craft Interior, a trained Sto Acoustic installer. “The overall installation was finished with Sto Silent Décor M in white, to create an eye-catching finish that is very in-keeping with the clean and minimalist design of the restaurant’s interior,” adds Graham Chadwick of Craft Interior. “The StoSilent Décor M is spray-applied and can be tinted to match a wide range of shades from the StoColor system”. The final effect has been extremely successful, with Lyle’s diners able to enjoy their meal in surroundings that are attractive and contemporary from both a visual and acoustic viewpoint. A StoSilent Distance acoustic attenuation solution has helped create a new acoustic environment at this leading London restaurant.